KP Elements Treatment Bundle - Our Treatment Cream is an all natural skin lotion specially formulated to eliminate the red, rough bumps on your upper arms and thighs caused by Keratosis Pilaris (KP). Keratosis pilaris affects 50% of adults and 80% of adolescents, and finally there is a line of products designed specifically to smooth and tone your skin to eliminate the irritation, roughness and redness it causes - so you can go sleeveless, with confidence. Our Body Scrub is an all natural body scrub specially formulated to eliminate the red, rough bumps on your upper arms and thighs caused by Keratosis Pilaris (KP). Our Body Scrub contains gentle scrubbing beads to wash away the extra keratin on the surface of your skin, leaving it smooth and allowing your hair follicles to recover from the inflammation caused by Keratosis Pilaris. Made with vitamin A, vitamin E, aloe vera extract, and jojoba seed oil, KP Elements Body Scrub helps your skin turn over naturally with smooth, healthy new skin cells. 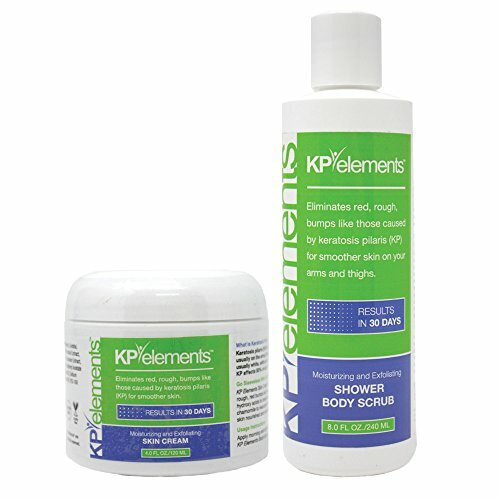 KP Elements works - your KP will be drastically reduced after 30 days of use, guaranteed or your money back. to treat red bumps on arms, thighs, and buttocks. Keratosis pilaris (aka chicken skin) is a very difficult condition to cure, and generic products are not as effective as our dermatologist-grade formula. This combo pack is designed to give you best possible KP treatment available. DERMATOLOGIST TESTED AND APPROVED - Have confidence in the product you are buying! THE MOST EFFECTIVE KP TREATMENT system on the market, now available in a convenient bundle! If you have any questions about this product by KP Elements, contact us by completing and submitting the form below. If you are looking for a specif part number, please include it with your message.